Many distributed applications rely on event correlation. Such applications, when not built as ad-hoc solutions, typically rely on centralized correlators or on broker overlay networks. Centralized correlators constitute performance bottlenecks and single points of failure; straightforwardly duplicating them can hamper performance and cause processes interested in the same correlations to reach different outcomes. The latter problem can manifest also if broker overlays provide redundant paths to tolerate broker failures as events do not necessarily reach all processes via the same path and thus in the same order. 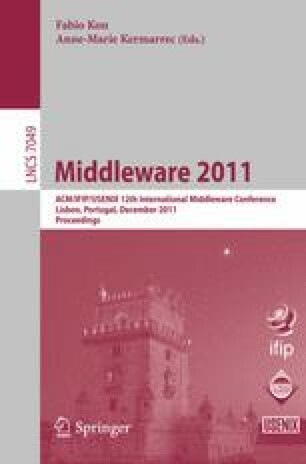 This paper describes FAIDECS, a generic middleware system for fair decentralized correlation of events multicast among processes: processes with identical interests reach identical outcomes, and subsumption relationships among subscriptions are considered for respectively delivered composite events. Based on a generic subset of FAIDECS’s predicate language, we introduce properties for composite event deliveries in the presence of process failures and present novel decentralized algorithms implementing these properties. Our algorithms are compared under various workloads to solutions providing equivalent guarantees. Financial support by NSF grants 0644013 and 0834529, DARPA grant N11AP20014. Any opinions, findings, conclusions, or recommendations in this paper are those of the authors and do not necessarily reflect the views of NSF or DARPA.